This lunchtime I heard a noise outside like a jet aircraft taxiing. I went out and found one of these sitting in the level crossing queue. It turns out this is the first day of Reading Buses' new route 3, which replaces the 144 that Thames BusesTravel ran for WBC. (The caption says it is a Scania ADL Enviro300SG.) Presumably the gimmicky colour scheme shows they are running out of distinguishable colours. Plus, it is a different kind of route for them - longer, and with distance-based fares. Up to now Reading Buses (owned by RBC, of course) has served greater Reading, almost half of which is not in Reading Borough, but not gone outside (I think that's true - and all the services on their map that do so were run by others). Whether this is a matter of greater cooperation with a neighbouring council, or trespassing on their patch, I'm not entirely sure. It is almost a return to past haunts for them. In years gone by they used to operate to Wokingham, Twyford and Maidenhead. I have a destInation blind in my loft which includes a variety of places they operated to, or hoped to. Interestingly the fare from Wokingham to Reading is ^7.00 and via a roundabout route - but the train fare is only ^4.30. But you do get wifi on the bus! This new service they are running commercially rather than the council funded Thames Travel route 144 it has replaced. Possibly James Freeman's swansong, before leaving to become MD of First Bristol and West of England. I guess he could always launch a service linking the two and competing with FGW. Well respected in the bus industry I gather. There is an article on getreading about his departure which I'm sure someone could post as I know it will go horribly wrong while I'm on a train! I knew him from university days and his passion for the bus industry was evident even then. For the last 30 or so years he's organised a bus rally in Winchester on New Years Day, though sadly the redevelopment of the bus station there has put paid to that. There is an article on getreading about his departure which I'm sure someone could post as I know it will go horribly wrong while I'm on a train! 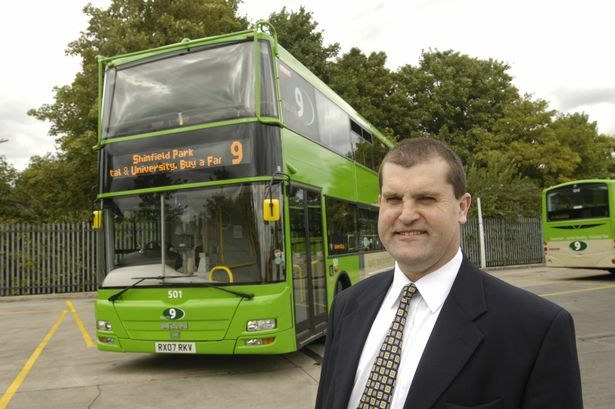 Reading Transport chief executive officer James Freeman is leaving the company to take up a new position in Bristol. Reading Buses announced today that Mr Freeman will leave the company at the end of September to take up the post of managing director of First Bristol & West of England. Chair of Reading Buses, David Sutton said: ^We are very sorry to be losing James, of course, but we recognise that this is a unique opportunity for him, in both personal and professional terms, and we wish him all the best for the future. He has done a marvellous job for Reading Buses in his seven years with us, and the awards recently won by the company testify to this. We will now be seeking to appoint a successor who can build on all James's excellent work and maintain the company's position as an award-winning and innovative national leader." This lunchtime I heard a noise outside like a jet aircraft taxiing............ I went out and found one of these sitting in the level crossing queue. It turns out this is the first day of Reading Buses' new route 3, which replaces the 144 that Thames Buses ran for WBC. (The caption says it is a Scania ADL Enviro300SG.) Presumably the gimmicky colour scheme shows they are running out of distinguishable colours. Plus, it is a different kind of route for them - longer, and with distance-based fares. Also do Reading Buses still own Newbury Buses? Could Newbury be comfortably classified as "Greater Reading"? Well, these things are not always as simple as they look, but ... Reading Buses used to use Newbury Buses as a brand name for a few services contracted to West Berkshire (D)C, but they no longer have any. Newbury and District is now the name used by Weavaway for some of their scheduled services, many contracted to WBC. N&D also runs the (apparently unsubsidised) Jet Black service, between Reading and Newbury, for Reading Buses. A big chunk of greater Reading (Calcot, part of Tilehurst, and up to Purley) is in West Berks. And not exactly near to Newbury. Hmmm - that's not quite right, is it? West Berkshire is a Unitary Authority. But then the whole business of names in the "Royal gap in the map formerly known as the County of Berkshire" is pretty baffling. Wokingham, Newbury, and Reading (plus others) were Districts in the old county, though Reading had a long history of being called a borough (RBC). They all became unitary authorities following "dematerialisation" of the county, but Newbury (in particular) was stretched to cover nearly half of Berkshire to give is an equal share of population - hence the name became West Berkshire. I don't recall seeing any of them use "Unitary" in its name. Wokingham was usually called WDC, kept that name as a unitary, then switched to "Borough" by a kind of deed poll; basically because they thought it sounded classier. West Berkshire has used WBDC in the past, but now styles itself "West Berkshire Council" and appears to avoid the initials WBC. Which is just as well, given Wokingham does use WBC quite freely. You didn't really expect logic, did you? At the last sighting, Reading was still running the "Jet Black" No 1 bus to Newbury. Reading brands its routes by colour. The most garish are the pink routes to Caversham - rumoured to be chosen to upset the remaining Tory Wards North of the river. Reading is one of only two remaining LA run bus operators. Its success is accepted across the political divide, so it should remain in public ownership. Its buses are usually modern unlike the decade old offerings of private operators, the one pictured is probably a hybrid. On June 29, there is a Reading Buses open day at the Gt Knollys St depot, usually with a free vintage bus connection to Reading General. Reading is one of only two remaining LA run bus operators. Its success is accepted across the political divide, so it should remain in public ownership. There are also 11 remaining local authority owned bus companies in the UK, some with sizeable fleets. The companies are: Blackpool Transport (175+75 trams), Cardiff Bus (240), Halton Borough Transport (61), Ipswich Buses (71), Lothian (600), Newport Transport (90), Nottingham City Transport (325 + 15 trams), Rossendale Transport (100), Reading Transport (155), Thamesdown Transport (105) and Warrington Borough Transport (125). The main operator in Northern Ireland Translink is also in public ownership with 1,600 buses. From a quick look these vary a lot in status, from 100% council owned to partly private. (I think they all had to turned into PLCs.) It may be some are now fully private, if that list is out of date - you'd have to check one by one. On the broader one, there is loads more illogic attached to this subject if you look for it! A POPULAR bus route linking Bracknell and Reading will be relaunched next week following the withdrawal of First buses from the town. Service 90, previously run by First, has been renamed as 'The lion 4' by new operators Reading Buses who are also introducing 10 new high-tech vehicles to service passengers between Bracknell, Wokingham and Reading. The new vehicles will be decked out with lion branding and come kitted out with superfast wifi and USB charging points for phones and laptops. A new timetable will be introduced from Monday (Aug 31) promising twice as many buses on a Sunday and more weekday evening services between Reading and Wokingham. Martijn Gilbert, Reading Buses CEO, said: "We are delighted to announce the launch of the lion as it roars around Wokingham, Bracknell and Reading. ^These buses will deliver a massive step change from the previous buses used on this route. They will have all the latest Reading Buses mod-cons including superfast 4G WiFi, USB charging points for phones and laptops, the new Reading Buses seat covering and ^coffee-shop^ style wood-effect flooring. ^We have also thought about the numbering of the route as feedback from customers and drivers was that having the same number for legs of the route in Bracknell was confusing. Some buses go fast along the main roads and others run through the southern estates." Faster buses between the main towns will be numbed X4 while the buses which service Bracknell's southern estates will simply be numbered 4. Reading Buses say they will be able to improve the service even further if it proves popular with passengers. Mr Gilbert said: ^The better buses and extra journeys represent a considerable investment and our commitment to the important and growing bus service corridor between Bracknell, Wokingham, Winnersh and Reading. Route 90 was taken over by Reading Buses on July 26 from First Berkshire. Ten buses and 25 drivers will operate the route, 19 of the drivers transferred from First^s Bracknell depot after the takeover. Today was a PR launch day - cue much tomfoolery, dressing up in safari kit, and fluffy toy lions. 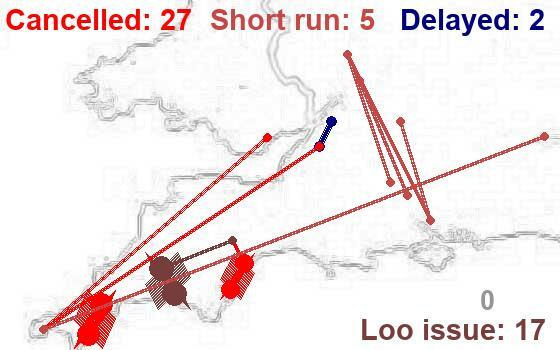 The Leopard route 3 is now ^4.50/^7.00 return, way more than the rail fare of ^3.40/^4.40. Off-peak saves only a little in either case; even the super off-peak rail return (only from Reading) is ^4.10. But that's not a direct route between centres, it exists to serve places off the direct route and link Wokingham with the Royal Berks Hospital. This Lion route runs close to the railway, and Wokingham to Reading is priced at ^4.70/^5.00. I'm sure that makes sense to someone ... How long does it take? It varies from 26 to 48 minutes, depending on the time, against 9 or 13 minutes for trains. There's a further invasion of Wokingham, with the July demise of the FB Reading - Bracknell 90 service and the September launch of Reading Buses' X4/4 route, serving the A329 and hinterland, with some Bracknell suburbs for the No 4, I understand. Hope it comes off. There's a lot of new buses to pay for. Makes a change from the normal doom and gloom we usually read on the forum regarding buses across the west.